A mixed shop for Asian indices with most playing either side of unchanged for much of the day. The Nikkei opened with a small gain but was again soon under pressure as continued trade war fears and US political concerns with the news that the US Special Council Robert Muller has subpoenaed the Trump Organization documentation. Not just the Nikkei but many Asian markets did not know how to respond to this especially ahead of the weekend. The focus for next week will be the meeting of the FED and given that we close this evening -4.8% YTD many will be hoping for positive help as Q1 will soon be upon us. 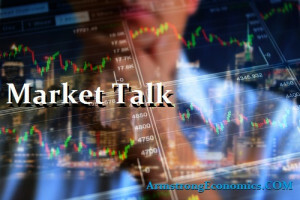 Both the Shanghai and Hang Seng saw similar trading patterns this Friday with both briefly lifted into positive territory in the afternoon only to close lower. The Shanghai closed on the days lows (-0.65%) in lack lustre trading. SENSEX closed down 1.5% with a 500 pointy decline in final minutes of trading. Energy, industrials and financials were all hit at the close to provide the biggest one day fall since early February. Looking as though the SENSEX remains heavy for next week also given the close with support below at 32, 650. Still keep an eye on the A$ as the pressure looks to be building for the commodity exporter which is probably why we saw the ASX close +0.45% today. All core European indices were treading water probably a result of the disappointing CP Index and so had to wait for US markets to provide direction. Russia’s international relationships are taking a toll on both their currency and bond markets. The Rouble hit a one month low today at 57.75 against the USD, taking the decline on the week to around 1.5%. Energy prices bounced over 1.25% today which helped sentiment but there is still much to play for next week. US markets opened well bid but we do have a lot of option expiry at the close which normally boosts volatility at the close, but was not to be today. On the week the S+P has fallen around 1% with real estate weighing on sentiment whilst regional banks benefit regulatory speculation even with todays gain. Major industrials have also beaten prices this week with Boeing getting a lot of the blame down around 7% from the highs set a couple of weeks ago. The key point was when the NASDAQ turned this week and that hit confidence into the weekend, a small bounce today, but many will be eager to see next weeks play. Japan 0.035%, US 2’s closed 2.29% (+1bp), US 10’s at 2.84% (+2bp), 30’s 3.08% (+2bp), Bunds 0.57% (u/c), France 0.82% (u/c), Italy 1.97% (u/c), Greece 4.15% (-2bp), Turkey 12.39% (-4bp), Portugal 1.73% (-3bp), Spain 1.35% (-1bp) and Gilts 1.43% (-1bp).